Improve your multiplication skills with this great town building simulation game! You can start by choosing the exact problems you wish to practice. Then click the "Start" button and creatively build your town of dreams. Join the young explorers in this magnificent underwater experience! After you choose the numbers to practice, you get into the sea. Multiplication problems will appear on the screen. 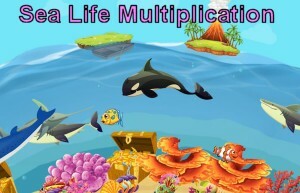 Answer correctly to populate the sea with plants, fish, shells and more! Airplanes will be flying in, descending slowly towards the eagle. 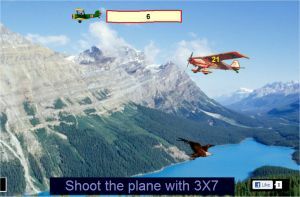 Shoot the airplane with the correct answer to the multiplication problem that appears below. Don't let them hit the eagle! A multiplication problem will appear on the blimp above the central park. Click the hot air balloon with the correct answer to fly it into the air. Win the game by flying 20 balloons. Four Apollo moon landers are approaching the moon, each one has a number on it. A multiplication problem will appear at the upper side of the screen. 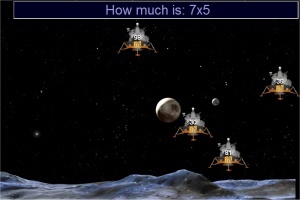 Find the moon lander that has the problem's correct answer, and click it, to make it boost on to its way. Try to get 20 correct answers to win the game. Hit the frog with the correct answer to the problem shown below. 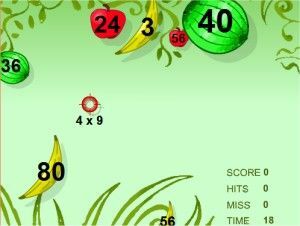 Aim and shoot the fruit that has the correct answer to the multiplication problem. Have fun shooting apples, bananas and watermelons. This is an underwater race. 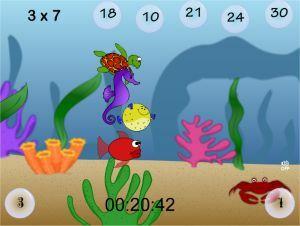 Choose the times table to practice, then choose the aquatic animal you wish to be, and the race begins. 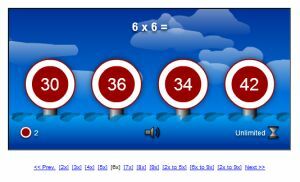 Times tables problems will appear on the screen, and you should click the bubble with the correct answer. Every correct answer will advance your animal ahead of your opponents. 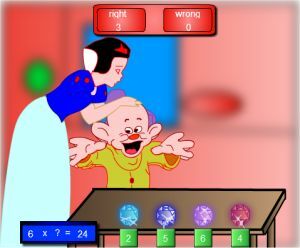 Choose the number under the correct diamond to receive a kiss from snow white. Choosing the wrong answer will bring in the witch! 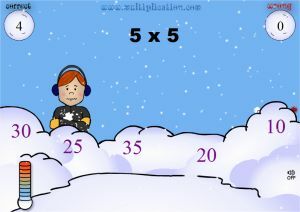 Click the correct answers to the multiplication problems to make Starfire jump successfully over the hurdles. 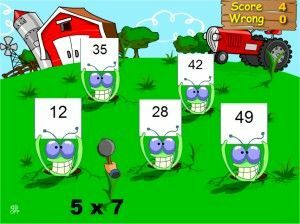 Match the multiplication problems with their correct answers, by clicking them sequentially. If you succeed to find all matches in the allotted time, you will proceed to the next level. 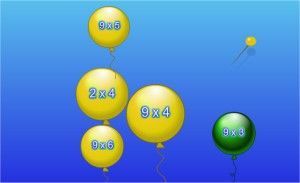 Balloons with multiplication problems will appear on the screen. Click and pop the balloons in ascending order of their values. The game is getting gradually harder because every level has one more balloon than the previous one. Numbered pumpkins will be falling from the sky. 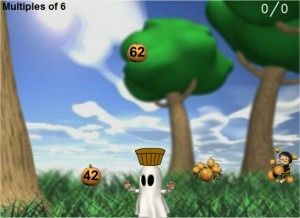 Use the arrow keys to move your ghost right and left, and catch in the basket those pumpkins that are multiples of the table practiced. 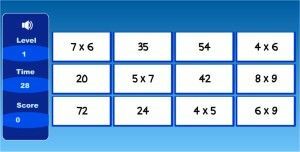 Start by choosing the "X" (for multiplication) in the "Easy" level. A multiplication problem will appear above. Three answers will be presented on the floor. Throw the ball from the floor location that has the correct answer. 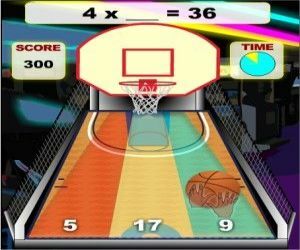 A multiplication problem will appear on the top of the screen. Click on the number that is the correct answer, and you will shoot a snowball on one of your friends. Watch out: Give a wrong answer and you will get hit by a snowball yourself! Too many wrong answers will make you loose the game. 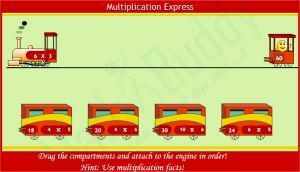 A multiplication problem appears on the train's engine. Look for the railcar with the correct answer, drag and attach it to the engine. This car has also a multiplication problem on it. Keep dragging the correct railcars until the train is complete. When you finish, send the train to its way by clicking the "Next" button. Start by choosing the table to practice (from 1 to 12) and the game speed. Meteors with multiplication problems will be flying slowly towards your spaceship. A number appears on your spaceship. Click and destroy the meteor with the multiplication problem that fits this number. You can choose to practice a specific times table by clicking the blue links under the game screen. 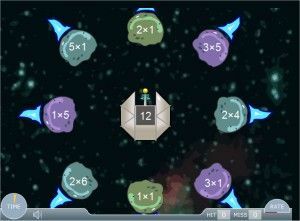 A multiplication problem will appear on the screen, along with 4 targets. Click the target with the correct answer, and a new problem will appear. 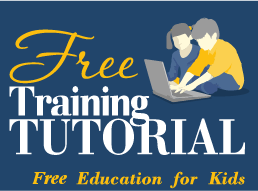 When your students are ready for computer exercises in multiplication, this page of online activities will help them put into practice what they’ve been taught, and even help them with enhancing new skills. As they are all interactive, they offer learning of a visual variety, which make them beneficial for most students. These particular unblocked activities are great for students in 2nd grade and 3rd grade, and let them play at their own pace. Some of the games are more competitive and have timers or scoring, while others offer less pressure and simply permit students to work on their math concepts in a no-stress environment. There are also games that start easy, and increase in difficulty as they are played, giving even advanced students the opportunity to challenge and sharpen their skills.